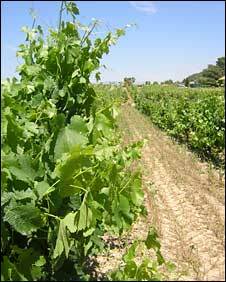 In Spain, the country with more land under vines than any other, it is harvest time for wine growers. Ten years ago, most wineries would start gathering in their grapes during September. However, climate change has caused the temperature to rise and now grape varieties are ripening up to a month earlier. Climate change is now a threat to the industry in Spain and a challenge for wine makers worldwide. "More merlot?" shouts a guide - almost an order rather than a question - to his group of tourists as he passes glasses of red liquor at a tasting in the Torres winery, in Penedes, near Barcelona. The red wines here in the region of Penedes are known for being fuller and fruitier than other Spanish vintages, like Rioja. Until now, experts say, the changes to grapes caused by higher temperatures - like fruitier flavours and higher concentrations of alcohol - have generally had a positive impact on the taste of wines all over the world. But if temperatures in Spain keep rising - and they have gone up by 2C on average in the past 50 years - the wines could taste very different and some vintages will be ruined. Wine makers, like Miguel Torres, are starting to take the threat of climate change very seriously. Mr Torres is one of Spain's biggest winemakers but he is also something of a climate change boffin and all around his vineyard you can see how seriously he takes this problem. Between the Torres vines, giant solar screens generate heat energy, dozens of photovoltaic panels produce electricity and water is recycled. "We are dedicating 5m euros (£4m) with two purposes," he explains. "Purpose number one is reforestation, we have done this already in Catalonia and in Canary Islands. "And the second purpose is anything related to research on trapping and storing carbon dioxide, and as a consequence of this we are already experimenting in our own cellars trying to capture the CO2 produced at fermentation." Reducing his vineyard's carbon footprint - in other words cutting emissions that contribute to the greenhouse effect and climate change - is something Mr Torres takes very seriously. To directly protect his business, he is experimenting with different grape varieties that are more resistant to high temperatures and taking other, more drastic steps. "It may be that in 30 or 40 years this place here, this vineyard, becomes too hot, too warm for the merlot," he says. "So then what we have to do, and we may do this in the next years, is to move merlot slowly to the mountain area. Mountain area why? Because with the altitude you have cooler climates." At smaller wineries, like the sparkling wine maker Gramona, the bottling is still done by hand but they are just as concerned about the threat of climate change. The grapes used to make sparkling wine are particularly sensitive to changes in the climate. Harvesting is done at night to protect the grapes from the heat and the grape juice is brought into the winery via metal pipes to further cool the fluid. Gramona also uses a very hi-tech system to monitor the grapes as they are actually growing: a weather station right in the middle of the vineyard. By taking data from a satellite and also cables that are stuck in the vines, Gramona technicians are able to measure the levels of acidity and sugar in the grapes. With that information, they can adjust the growing conditions accordingly by adding nutrients to the soil or repositioning the vine canopy. There is even a machine designed to measure the bubble capacity of the grapes that will make the cava. Jaume Gramona says his winery is investing 1m euros (£790,000) in a four-year climate change study because it is very concerned that rising temperatures are already affecting its grapes. "The grapes are ripening earlier so we have to harvest them in August, which is up to a month earlier than we did 10 years ago," he says. 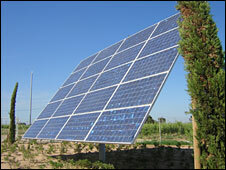 "We also have to protect the grapes more from the sun by allowing their leaves to grow thicker. And now it's more difficult for the cava grapes to absorb carbonic gas which makes their creamy bubbles." Mr Gramona says so far they have managed to maintain the quality of their sparkling wines but he fears they could be seriously affected in the future. The Torres and Gramona wineries are the exceptions in their approach. Pancho Campo, president of the Wine Academy of Spain says that, worldwide, most wine makers are are not doing enough about climate change because it is not yet affecting their income. "The industry needs to be aware that there is a problem," says Mr Campo. "The sooner we address the problem it will be cheaper and it will be easier to face the consequences in the future." Consumers are already tasting a result of climate change. Regions once too cold to grow grapes are now producing wine and competing for markets. This could be the wine industry's climate change wake-up call. "Belgium, Denmark, Holland are countries that, you know, 20 years ago you would never have imagined that they were going to produce wine, quality wine. 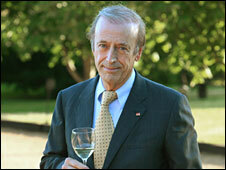 Well, they are already producing some interesting wines," says Mr Campo. The future for some winemakers could depend not only on how well they can adapt to the changing weather, but also if they can survive the new competition.